“……….Dennis Riches (DR): Instead of a question I thought we would ask you to comment on something that has been published by an organization called Waste Management Symposia (Waste Management Symposia Inc. http://www.wmsym.org/wm2019 ). 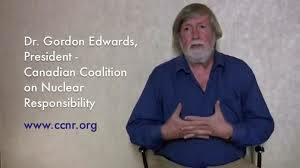 They are a non-profit organization, but they seem to be something that was set up by the nuclear industry so that different players in the field could get together and talk about waste management issues. They have a symposium coming up in March of 2019. So when the last government approached this problem they decided, being Conservative, that it’s better to get private enterprises to look after these things, so they hired a consortium of multinational corporations to solve the problem for us, and in the absence of any policy—the trouble is that Canada has absolutely no policy regarding any nuclear waste except for the irradiated nuclear fuel itself……….. But if we just back off on all this, the way my organization sees the picture, my organization being the Canadian Coalition for Nuclear Responsibility, which formed in the early 1970s—Well, basically in 1974 we formed, and from our view, the first thirty years of the nuclear age were characterized by a total ignorance about nuclear waste. That is, the public was not informed that there was such a thing as nuclear waste and the decision-makers who authorized the spending of billions of dollars in building a nuclear infrastructure and nuclear reactors were also not informed that this was a major unsolved problem. So it was basically a lie. Well, of course, that was then and this is now, and in the light of experience in the intervening years… In the mid-1970s there was a series of reports in Canada, the United Kingdom, the USA and other countries calling attention to this nuclear waste problem and basically saying quite plainly that unless this problem could be adequately solved that there should be no more nuclear power plants built. So I call this the nuclear ultimatum. It was really an ultimatum to the nuclear industry: You do not have a future if you don’t solve this problem. And because the industry said that they knew what to do with it, the expectation was that they could solve it in ten or twenty years. It would only take ten or twenty years………. 5. Barbaric plans for nuclear waste And now we have this consortium of private companies that has come into Canada to deal with not the irradiated nuclear fuel, but the decommissioning waste and the other post-fission waste, and they have come up with what we consider to be barbaric suggestions…….